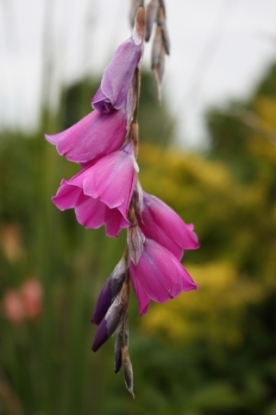 DIERAMA ANGEL'S FISHING ROD, WANDFLOWER. In general, they like full sun in a well drained soil and perform best with ample summer water. 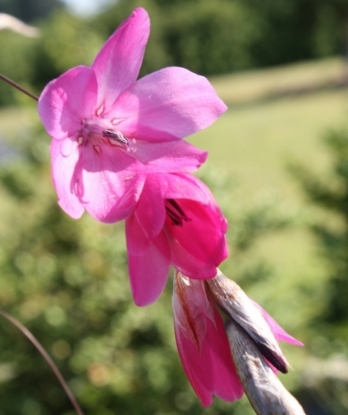 They'll thrive in zones 8 and colder in a rich soil like most other plants, but can potentially loose winter hardiness. This at least has been our experience. We suspect a rather lean, rocky soil would be better. As far as taking the cold, we had some in 4" pots surviving 8°F with minimal protection. 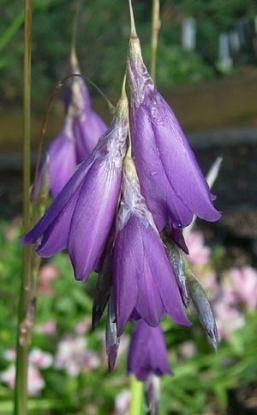 Either way, we recommend to experiment with lesser expensive Dierama first before you get into the more expensive selections. Large bells in pink shades.